Introduction: Complementary and alternative medicine such as biofield energy therapies are highly popular in biomedical health care. The study evaluates the impact of Mr. Trivedi’s biofield energy treatment on Pseudomonas aeruginosa (P. aeruginosa) to evaluate its phenotypic and genotypic characteristics. Methods: P. aeruginosa ATCC 10145 (American Type Culture Collection) was procured from Bangalore Genei, in sealed pack and divided into control and treated groups. Treated group was subjected to biofield treatment and analyzed for antibiogram, biochemical reactions, and biotype number using automated MicroScan Walk-Away® system on day 10. The treated sample was evaluated for DNA polymorphism by Random Amplified Polymorphic DNA (RAPD) and 16S rDNA sequencing to establish the phylogenetic relationship, the epidemiological relatedness and genetic characteristics. 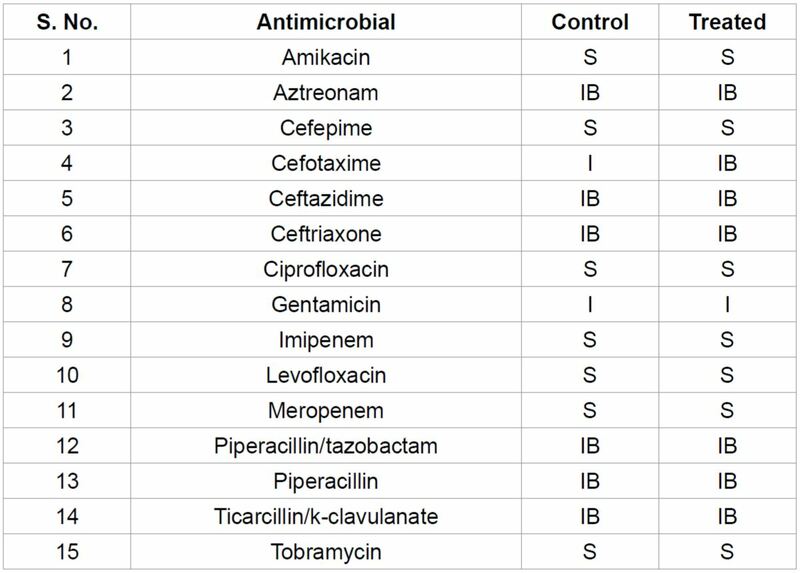 Results: Data showed altered sensitivity pattern in antibiotic cefotaxime from intermediate to decreased β-lactamases activity, with four-fold decreased minimum inhibitory concentration (MIC), i.e. 32 to ≤8 µg/mL as compared to control. Similarly, cefotetan and extended-spectrum-β-lactamases (ESBL-b Scrn) showed decrease in MIC values as compared to the control group. Nitrate reported for negative biochemical reaction i.e. positive (+) to negative (-) after biofield treatment on P. aeruginosa. The biotyping showed a change in biotype number (02063722) as compared to the control (02063726), without altering the microorganism. RAPD analysis showed an average range of 30 to 50% of polymorphism, while 16S rDNA sequencing analyzed treated sample as Pseudomonas aeruginosa (GenBank Accession Number: EU090892) with 99% identity of gene sequencing data. Conclusion: These results suggest that Mr. Trivedi’s unique biofield energy treatment on P. aeruginosa has an impact to alter the antimicrobial sensitivity pattern and MIC values, thus it can be used as an alternate integrative approach of energy medicine in near future. 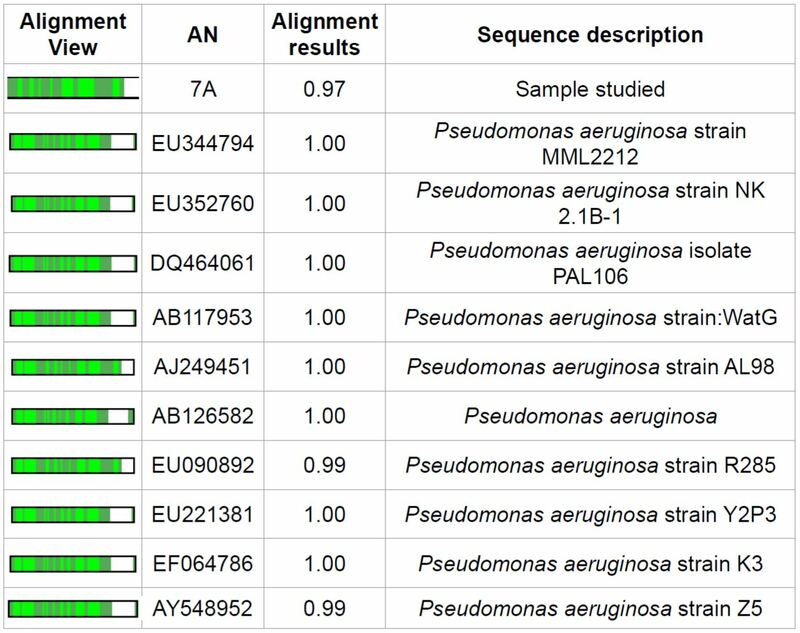 The genus Pseudomonas is a Gram-negative, ubiquitous, rod-shaped, versatile opportunistic pathogen associated with nosocomial infections and other health related complications . Some species are reported as pathogenic to plants  as well as opportunistic to animals or humans . However, some species were reported to be used as bio-control agent, due to its plant growth promoter and pathogen suppressing function . The increased prevalence of Pseudomonas aeruginosa in health care settings and its associated infections , restrain the effectiveness of antimicrobial therapy, which causes life threatening conditions . It is one of the major pathogen associated with the hospital-acquired infections especially in intensive care unit . The mechanism behind resistance pattern is due to acquisition of resistance genes (β-lactamases) or because of amino-glycoside modifying enzymes , or due to the chromosomal genes mutation involved against antimicrobials . Unfortunately, the antimicrobial therapy approach creates the underlying selection pressure, and lead to develop resistance. A paradigm is now shifted with respect to the treatment of infectious diseases with antibiotics, where appropriate alternatives to antibiotics ought to be considered . Several non-antibiotic approaches and prevention of infection including complementary and alternate medicines (CAM) are now preferred against P. aeruginosa . CAM includes several energy medicines, among which biofield therapy (or healing modalities) is one of the approach, which was reported to have several benefits to enhance both physical and emotional human wellness . Researchers are trying to investigate the relationship between biophysical, biochemical, and psycho-physiological mechanisms of disease and healing modalities. However, National Center for Complementary and Alternative Medicine (NCCAM) has funded to study the clinical application of biofield therapies in The Center for Frontier Medicine in Biofield Science (CFMBS), as a part of the National Institute of Health (NIH) . Biofield is described as the endogenous energy field of the body, and defined as the electromagnetic field that permeates and surrounds living organisms . Various internal physiological processes such as blood flow, brain, heart function, etc. that generate biofield. Biomagnetic fields around the human body can be measured using different techniques such as Kirlian photography, polycontrast interference photography (PIP) and resonance field imaging (RFI) . Thus, it can be concluded that the human can harness the energy from the environment or universe and can transmit into any living or nonliving object(s) around the Universe. The objects always receive the energy and responding to the useful way that is called biofield energy treatment. Mr. Trivedi’s unique biofield treatment is also known as The Trivedi Effect®. It has been studied in the field of materials and ceramic sciences research [16,17], agricultural science research [18,19], biotechnology research , and altering the activity of pharmaceutical compounds , antimicrobials sensitivity of pathogenic microbes [22,23]. After evaluating the increasing use of CAM and failure of antimicrobial drug therapy against P. aeruginosa, the present study was designed to evaluate the impact of Mr. Trivedi’s biofield energy treatment on P. aeruginosa with respect to antibiogram analysis. The genotyping was performed to identify the strain differentiation and distinctive polymorphism using the polymerase chain reaction (PCR) technique of random amplified polymorphic DNA analysis (RAPD) and 16S rDNA sequencing. P. aeruginosa ATCC 10145 (American Type Culture Collection) was procured from Bangalore Genei, in sealed pack, and stored as per the recommended storage conditions for further use. The antimicrobial susceptibility, biochemical reactions, and biotype number were evaluated using MicroScan Walk-Away® (Dade Behring Inc., West Sacramento, CA) using Negative Breakpoint Combo 30 (NBPC 30) panel. DNA fingerprinting (RAPD) and the 16S rDNA sequencing studies were carried out using Ultrapure Genomic DNA Prep Kit; Cat KT 83 (Bangalore Genei, India). All the tested antimicrobials, biochemicals, and reagents were procured from Sigma-Aldrich, India. P. aeruginosa strain was divided into two groups; one was kept as a control sample while the other was subjected to Mr. Trivedi’s unique biofield energy treatment and coded as treated group. The treated group was in sealed pack and handed over to Mr. Trivedi for biofield energy treatment under standard laboratory conditions. Mr. Trivedi provided the energy treatment through his energy transmission process that includes bioenergy emission of certain wavelength, which has the ability to do the changes in the microbes without touching the sample. Mr. Trivedi visited the laboratory individually over a period of treatment and for control experiments, nobody entered the experimental room during the treatment period. After treatment, control and treated groups were assessed on day 10 for antimicrobial susceptibility, minimum inhibitory concentration (MIC), biochemical reactions, biotype, and genotyping using RAPD and 16S rDNA sequencing analysis. Antimicrobial susceptibility assay of control and treated group of P. aeruginosa was carried out using MicroScan Walk-Away® using Negative Breakpoint Combo 30 (NBPC30) panel as per the manufacturer’s instructions. The panel was allowed to equilibrate to room temperature prior to rehydration. The test was carried out on MicroScan, which was miniaturized of the broth dilution susceptibility test. Briefly, 100 μL of the standardized suspension of P. aeruginosa was pipetted into 25 mL of inoculum water using pluronic and inverted 8-10 times and inoculated, rehydrated, and then subjected to incubation for 16 hours at 35°C. Rehydration and inoculation were performed using the RENOK® system with inoculators-D (B1013-4). The detailed experimental procedures and conditions were followed as per the manufacturer’s instructions. Briefly, after inoculation and rehydration with a standardized suspension of P. aeruginosa, it was incubated at 35°C for 16 hours. The MIC and a qualitative susceptibility like susceptible (S), intermediate (I), and inducible β-lactamases (IB) were determined by observing the lowest antimicrobial concentration showing growth inhibition . The biochemical reactions of P. aeruginosa were determined by MicroScan Walk-Away® system, using photometric or fluorogenic reader. On the basis of nature of bacilli (Gram-negative or Gram-positive), computerized reports were generated using conventional panels, which utilizes the photometric reader. Before commencing the experiment, the NBPC 30 panel was first incubated and read on the MicroScan Walkaway system. After evaluating the experimental reading on the Walkaway system, the NBPC 30 panel was removed from system and recorded on the Biomic system within 1 hour. Instrument consist of a database associated with collective information, which was required to identify the microbes with respect to group, genera, or species of the family. Detailed experimental procedure was followed as per manufacturer-recommended instructions . The biotype number of P. aeruginosa was determined by MicroScan Walk-Away® processed panel data utilizing the data of biochemical reactions . DNA fingerprinting was performed on three series of inoculum, using control and two treatment samples (A and B) prepared from P. aeruginosa. Two inoculums (A and B) were exposed with Mr. Trivedi’s biofield energy treatment. Further, the treated samples (A and B) were sub-cultured by taking 1% inoculum and inoculated to fresh 5 mL medium and labeled as treated A-1 and treated B-1. The samples were further incubated at 37°C with 160 rpm for 18 hour. Simultaneously, the cultures were spun down, and the genomic DNA was isolated for control and treated samples using Genomic DNA Prep Kit (Bangalore Genei, India). RAPD analysis was studied with all the samples of P. aeruginosa using standardised five RAPD primers, which were named as RBA8A, RBA13A, RBA20A, RBA23A, and RBA25A. The PCR mixture contained 2.5 μL of buffer, 4.0 mM of dNTP, 2.5 μM of primer, 5.0 μL of genomic DNA, 2U of Taq polymerase, 1.5 μL of MgCl2 and 9.5 μL of nuclease-free water in a total of 25 μL mixture. PCR amplification protocol followed with initial denaturation at 94ºC for 7 min, followed by 8 cycles of denaturation at 94ºC for 1 min, annealing at 35ºC for 1 min, and extension at 72ºC for 2 min; and 35 cycle of denaturation at 94ºC for 1 min, annealing at 38ºC for 1 min, and extension at 72ºC for 1.5 min; and the final extension at 72ºC for 7 min. The amplified PCR products (12 μL) from all samples (control and treated) were separated on 1% agarose gels at 75 volts, stained with ethidium bromide and visualized under UV illumination . Where, A = number of polymorphic bands in treated sample; and B = number of polymorphic bands in control. Gene sequencing was performed by isolating the genomic DNA and purified from a treated group of P. aeruginosa cells using genomic purification Kit, according to the manufacturer’s instructions. The PCR product was bi-directionally sequenced using the forward, reverse, and an internal primer. DNA 16S region amplification was performed using the primer set 16S forward and reverse primer . 16S rDNA gene (~1.5 kb) was amplified by universal primers; forward primer (5ˊ-AGAGTTTGATCCTGGCTCAG-3ˊ) and reverse primer (3ˊ-ACGGTCATACCTTGTTACGACTT-5ˊ). Amplification was carried out in a rapid cycler thermocontroller, with initial denaturation, annealing and extension temperature. Following amplification products were analyzed by gel electrophoresis at 100 V (in 1.0% agarose gel, 0.2 µg of ethidium bromide mL-1) in tris-acetate buffer (TAE), and visualized under UV light in a gel documentation unit (BioRad Laboratories, USA). The amplified fragment of PCR was purified from the agarose gel by DNA Gel Extraction Kit. The sequencing of amplified product was carried out on a commercial basis from Bangalore Genei, India. The obtained 16S rDNA sequences data were aligned and compared with the sequences, available in GenBank database of National Center for Biotechnology Information (NCBI) using the algorithm BLASTn program. 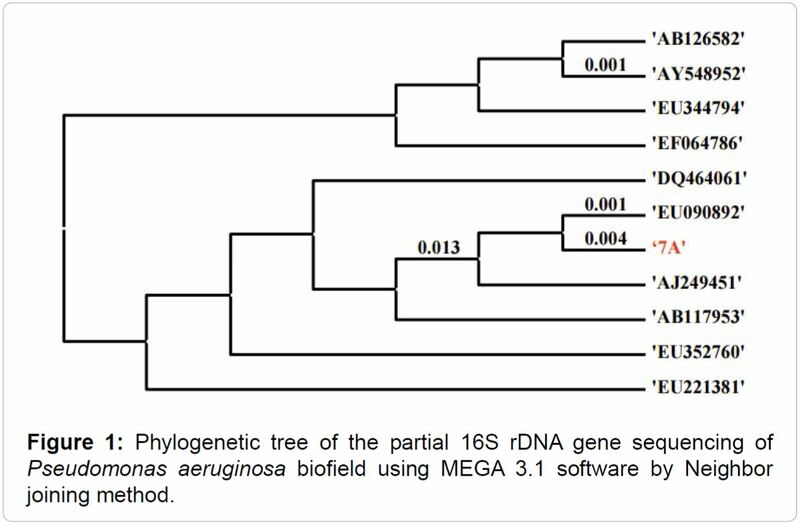 The multiple sequence alignment/phylogenetic tree was constructed using MEGA 3.1 software using neighbor-joining method . IB: Inducible β-lactamases; Resistant; I: Intermediate; S: Susceptible; ESBL: Suspected extended-spectrum β-lactamases; Antimicrobial susceptibility pattern in control and treated groups were evaluated using automated MicroScan Walk-Away® system using NBPC30 panel. Table 1: Effect of biofield treatment on multidrug resistant lab isolates of Pseudomonas aeruginosa to antimicrobial susceptibility. by four folds after biofield energy treatment on P. aeruginosa. Increase resistant of antimicrobials for P. aeruginosa has become a challenge for clinicians to select appropriate anti-pseudomonal antimicrobials. Antimicrobial sensitivity of cefotetan was also reported for broad spectrum of activity against Gram-negative microbes , but cefotetan will be highly active and shows synergistic action if taken in combination with other β-lactam antibiotics . Biofield treatment result showed a slight decrease in MIC value of cefotetan as compared to control. Resistance mechanisms involved in P. aeruginosa includes aminoglycoside-modifying enzymes, efflux pumps, porin loss, and various target site modifications . P. aeruginosa has been reported for acquired resistance by the production of plasmid mediated AmpC-β-lactamase, ESBL and metallo β-lactamase enzymes . Biofield treatment has showed decreased MIC value of ESBL-b Scrn among the tested antimicrobials as compared to the control. The alterations might affect the β-lactamases production, which may lead to decrease the MIC, which is required to inhibit the growth of P. aeruginosa. Biofield energy treatment might act on the enzymatic or genetic level, which might affect the resistance mechanism, and lead to decrease the MIC value. MIC values are presented in µg/mL; ESBL: Suspected extended-spectrum β-lactamases a, b screen; MIC values in control and treated groups were evaluated using automated MicroScan Walk-Away® system using NBPC30 panel. change in biotype number (02063722) in treated group as compared to the control (02063726). Organism identified in both the groups was same as P. aeruginosa. Biotype number alteration was based on the biochemical characteristics. Our research group recently reported the alterations in biochemical reactions followed by the change in biotype number [22,23]. -: negative; +: positive; Biochemical reactions in control and treated groups were evaluated using automated MicroScan Walk-Away® system using NBPC30 panel. Table 3: Effect of biofield treatment on multidrug resistant lab isolates of Pseudomonas aeruginosa to the vital processes occurring in living organisms. unique and dissimilar bands among control and treated samples. DNA polymorphism analyzed by RAPD analysis, a total number of bands, common, and unique bands are summarized in Table 4. The level of polymorphism in terms of percentage values between control and treated samples (A, A1, B, and B1) are presented in Table 5. The level of polymorphism was found with an average range of 30 to 50% in treated samples as compared to control, while 16 to 28% among treated samples of P. aeruginosa after the biofield treatment. The highest change in DNA sequence was observed in treated groups with RBA 23A primer as compared to control; however no change was found in treated group (control and A1, B, and B1; B and B1, A1 and B1) with RBA 20A primer as compared to control. RAPD also explain the relevant degree of genetic diversity. However, this technique has the potential to detected polymorphism throughout the entire genome. Table 4: DNA polymorphism of treated biofield Pseudomonas aeruginosa analyzed by random amplified polymorphic DNA (RAPD) analysis. Table 5: Level of polymorphism between control and biofield energy treated Pseudomonas aeruginosa samples. AN: Accession number; Total 1500 base nucleotide of 16S rDNA gene sequences were analyzed by multiple alignments using ClustalW program. Pairwise distance (lower left) and number of nucleotide difference (upper-right) for 16S forward and reverse primer was presented using Kimura-2 Parameters. Table 7: Distance matrix based on nucleotide sequence homology (Using Kimura-2 Parameter) indicates nucleotide similarity (above diagonal) and distance (below diagonal) identities between the studied sample ‘7A’ and ten other closest homologs microbe. alterations and similarities using RAPD and 16S rDNA sequencing methods. Based on the study results, it was found that the cefotaxime sensitivity was changed, while decrease in MIC value was reported in case of cefotaxime (i.e. 32 to ≤ 8 µg/mL), cefotetan (i.e. >32 to 32 µg/mL) and ESBL-b Scrn (i.e. >1 to ≤1 µg/mL) as compared with the control. The biochemical reaction of nitrate was altered followed by a change in biotype number (02063722) in treated group as compared to the control biotype number (02063726). Using five RAPD markers, the sample was characterized and showed 30 to 50% interspecific polymorphic relationship with P. aeruginosa after biofield treatment as compared to the control. 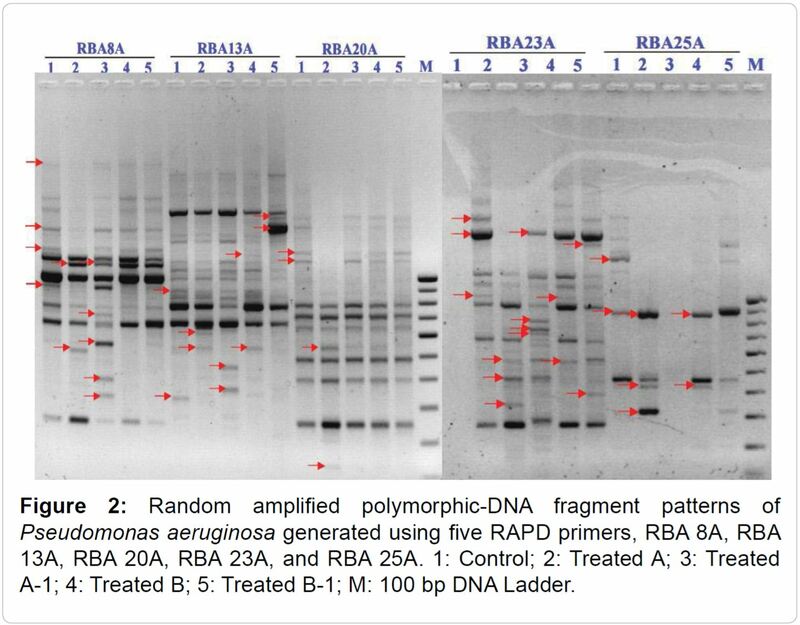 After biofield treatment, molecular analysis using 16S rDNA analysis showed that the sample was detected as Pseudomonas aeruginosa with 99% identity. So, it can be concluded that Mr. Trivedi’s biofield energy treatment on P. aeruginosa has an impact in altering the sensitivity of antimicrobials, which might be used as an alternative therapy (healing treatment) in future. This work was supported by Trivedi Science™, Trivedi Master Wellness™ and Trivedi Testimonials. Authors acknowledge the generosity and cooperation of all participating members from PD Hinduja National Hospital and MRC, Mumbai, Microbiology Lab for conduction antimicrobial studies. Authors grateful to Bangalore Genei Private Limited, for conducting RAPD and 16S rDNA sequencing analysis. 1. NJ Palleroni (1984) Genus I. Pseudomonas. Bergey’s manual of systematic bacteriology. Williams & Wilkins, Baltimore, MD, US. 2. Vos PD, Goor M, Gillis M, Ley JD (1985) Ribosomal ribonucleic acid cistron similarities of phytopathogenic Pseudomonas species. Int J Syst Evol Microbiol 35: 169-184. 3. Tyler SD, Strathdee CA, Rozee KR, Johnson WM (1995) Oligonucleotide primers designed to differentiate pathogenic pseudomonads on the basis of the sequencing of genes coding for 16S-23S rRNA internal transcribed spacers. Clin Diagn Lab Immunol 2: 448-453. 4. Keel C, Weller DM, Natsch A, Défago G, Cook RJ, et al. (1996) Conservation of the 2,4-diacetylphloroglucinol biosynthesis locus among fluorescent Pseudomonas strains from diverse geographic locations. Appl Environ Microbiol 62: 552-563. 5. Acar JF (1997) Consequences of bacterial resistance to antibiotics in medical practice. 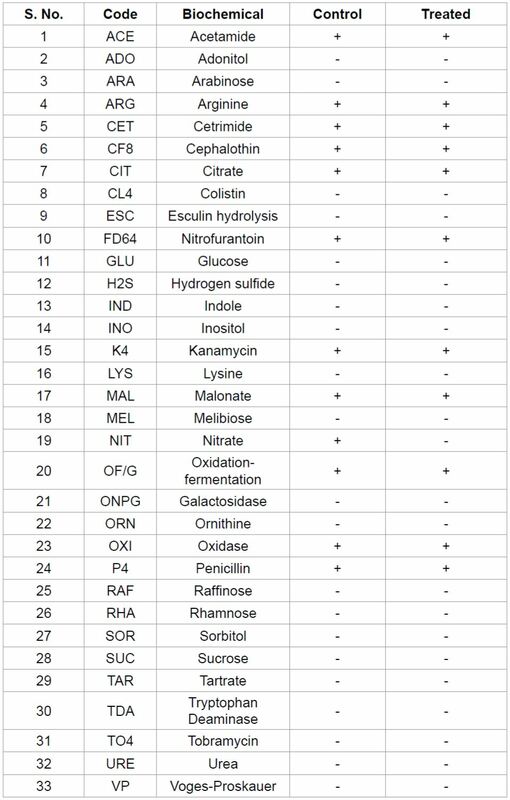 Clin Infect Dis 24 Suppl 1: S17-18. 6. Kerr KG, Snelling AM (2009) Pseudomonas aeruginosa: a formidable and ever-present adversary. J Hosp Infect 73: 338-344. 7. Rossolini GM, Mantengoli E (2005) Treatment and control of severe infections caused by multiresistant Pseudomonas aeruginosa. Clin Microbiol Infect 11 Suppl 4: 17-32. 8. Poole K (2005) Aminoglycoside resistance in Pseudomonas aeruginosa. Antimicrob Agents Chemother 49: 479-487. 9. Strateva T, Yordanov D (2009) Pseudomonas aeruginosa - a phenomenon of bacterial resistance. J Med Microbiol 58: 1133-1148. 10. Carson CF, Riley TV (2003) Non-antibiotic therapies for infectious diseases. Commun Dis Intell Q Rep 27 Suppl: S143-146. 11. Ulrey RK, Barksdale SM, Zhou W, van Hoek ML (2014) Cranberry proanthocyanidins have anti-biofilm properties against Pseudomonas aeruginosa. BMC Complement Altern Med 14: 499. 12. Movaffaghi Z, Farsi M (2009) Biofield therapies: biophysical basis and biological regulations? Complement Ther Clin Pract 15: 35-37. 13. Center for frontier medicine in biofield science (2007) University of Arizona and Institute for Frontier Science. 14. Jain S, Mills PJ (2010) Biofield therapies: helpful or full of hype? A best evidence synthesis. Int J Behav Med 17: 1-16. 15. Prakash S, Chowdhury AR, Gupta A (2015) Monitoring the human health by measuring the biofield “aura”: An overview. IJAER 10: 27637-27641. 16. Trivedi MK, Patil S, Nayak G, Jana S, Latiyal O (2015) Influence of biofield treatment on physical, structural and spectral properties of boron nitride. J Material Sci Eng 4: 181. 21. Trivedi MK, Patil S, Shettigar H, Singh R, Jana S, et al. (2015) An impact of biofield treatment on spectroscopic characterization of pharmaceutical compounds. Mod Chem Appl 3: 159. 23. Trivedi MK, Patil S, Shettigar H, Gangwar M, Jana S (2015) An effect of biofield treatment on Multidrug-resistant Burkholderia cepacia: A multihost pathogen. J Trop Dis 3: 167. 25. Welsh J, McClelland M (1990) Fingerprinting genomes using PCR with arbitrary primers. Nucleic Acids Res 18: 7213-7218. 26. Alm EW, Oerther DB, Larsen N, Stahl DA, Raskin L (1996) The oligonucleotide probe database. Appl Environ Microbiol 62: 3557-3559. 27. Kumar S, Tamura K, Nei M (2004) MEGA3: Integrated software for Molecular Evolutionary Genetics Analysis and sequence alignment. Brief Bioinform 5: 150-163. 28. 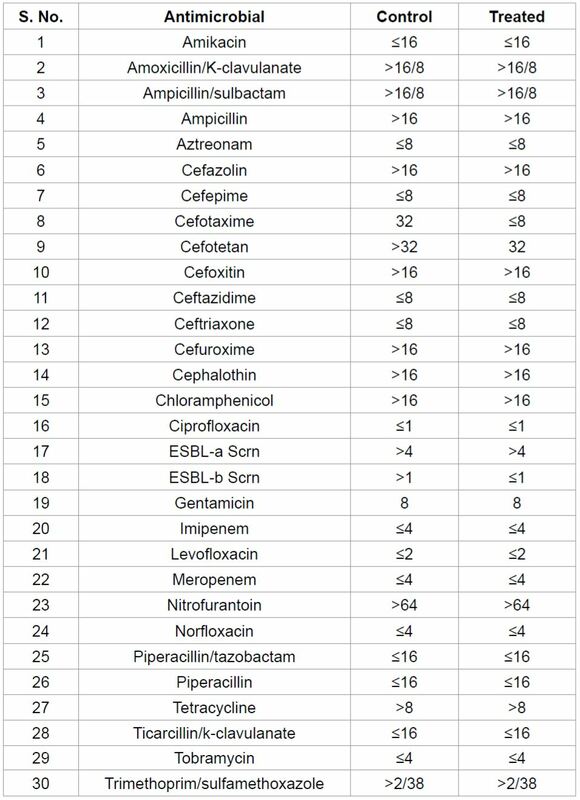 Orrett FA (2004) Antimicrobial susceptibility survey of Pseudomonas aeruginosa strains isolated from clinical sources. J Natl Med Assoc 96: 1065-1069. 29. Sivanmaliappan TS, Sevanan M (2011) Antimicrobial Susceptibility Patterns of Pseudomonas aeruginosa from Diabetes Patients with Foot Ulcers. Int J Microbiol 2011: 605195. 30. de Man P, van Der Veeke E, Leemreijze M, van Leeuwen W, Vos G, et al. (2001) Enterobacter species in a pediatric hospital: horizontal transfer or selection in individual patients? J Infect Dis 184: 211-214. 31. Ward A, Richards DM (1985) Cefotetan. A review of its antibacterial activity, pharmacokinetic properties and therapeutic use. Drugs 30: 382-426. 32. Kubo M, Kato Y, Inamori Y (1985) Studies on the combination action of sisomicin, gentamicin and cefmenoxime, ceftizoxime, cefoperazone, cefotetan against Serratia marcescens and Pseudomonas aeruginosa. Jpn J Antibiot 38: 3487-3496. 33. Zavascki AP, Carvalhaes CG, Picao RC, Gales AC (2010) Multidrug-resistant Pseudomonas aeruginosa and Acinetobacter baumannii: Resistance mechanisms and implications for therapy. Expert Rev Anti Infect Ther 8: 71-93. 34. Aggarwal R, Chaudhary U, Bala K (2008) Detection of extended-spectrum beta-lactamase in Pseudomonas aeruginosa. Indian J Pathol Microbiol 51: 222-224. 35. Arai T, Otake M, Enomoto S, Goto S, Kuwahara S (1970) Determination of Pseudomonas aeruginosa by biochemical test methods. II. Acylamidase test, a modified biochemical test for the identification of Pseudomonas aeruginosa. Jpn J Microbiol 14: 279-284. 36. Williams JG, Kubelik AR, Livak KJ, Rafalski JA, Tingey SV (1990) DNA polymorphisms amplified by arbitrary primers are useful as genetic markers. Nucleic Acids Res 18: 6531-6535. 37. Williams JG, Hanafey MK, Rafalski JA, Tingey SV (1993) Genetic analysis using random amplified polymorphic DNA markers. Methods Enzymol 218: 704-740. 38. Woese CR (1987) Bacterial evolution. Microbiol Rev 51: 221-271. 39. Rubik B (2002) The biofield hypothesis: its biophysical basis and role in medicine. J Altern Complement Med 8: 703-717. 40. Clarke TC, Black LI, Stussman BJ, Barnes PM, Nahin RL (2015) Trends in the use of complementary health approaches among adults: United States, 2002-2012. Natl Health Stat Report : 1-16.